This analysis is based on Miasm revision 2cf6970. using the DependencyGraph, whose goal is to track all the lines which participate to the value of a selected variable. We won’t introduce this module here, because a future post will be dedicated to it. So at this point, as the xored memory is located at [ECX + 0x30], the pointer is in fact (EAX_init+0xFFFFFFF0) + 0x30 = EAX_init + 0x20. By the way, EAX_init is the value of EAX in the initial symbolic execution state. Actually, the shellcode has information about the value of EAX when it’s run by the application. What I didn’t say is that this shellcode was executed after an exploit which leads to the corruption of a vtable leading to a CALL EAX. Hence the shellcode knows that when its first instruction is executed, EAX points to it. If you don’t want to bother writing Python code only to run a symbolic execution, the script miasm/example/ida/symbol_exec.py will do the trick. Under IDA, hit Alt-F7 and run the script. Now, select the code you want to execute and hit F3. Note: the script only displays modified registers and memory. 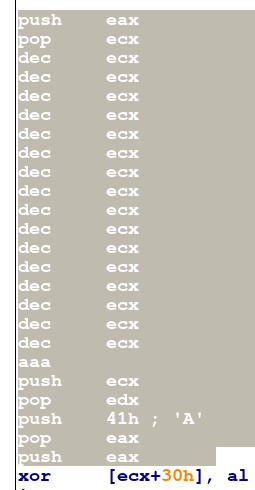 Here again, the value of ECX is EAX_init+0xFFFFFFF0. Please, note that Miasm2 must be in IDA’s python path for the script to run properly. So the shellcode will modify itself. Even if we could continue the analysis manually, here we are going to use the Miasm sandbox to run a dynamic execution. To continue the analysis, we will emulate the shellcode in a sandbox. For this, Miasm offers multiple solutions. Now, the execution is able to continue after the self modifying code. Note that the logs are very verbose. From now on, we will only activate the block trace (see previous article for more details). Miasm translates the first basic block and starts its execution. The execution reaches the automodifying code, which messes up the current basic block. The execution stops and this block is removed from the cache. Note this new basic block is a bit different from the end of the first basic block. The code above is another deciphering loop. At this point, we will add a breakpoint at address 0x4000004b to dump the shellcode. This breakpoint will trigger a callback which dumps the deciphered code from memory to the disk. Here, EAX is 0x0, so the memory lookup is at address 0x30 which is not mapped in memory. But there is a trick: the real memory lookup uses the segment selector FS. By default, Miasm doesn’t emulate segmentation, which explains the previous outcome. We can map a memory page at address 0x30 in which we insert a fake PEB data. The other solution is to assign a value to the segment selector FS and a corresponding segment descriptor with a custom base address. This base address will be a fresh memory area filled with a fake PEB structure. You also have to activate the segmentation support in Miasm. Painful isn’t it? Fortunately, Miasm implements a minimal Windows structures emulation (miasm2.os_dep.win_api_x86_32_seh.py). The PEB contains interesting information like the linked list of the modules mapped in memory by the loader. By default, if you activate the Windows structures emulation, Miasm will create a PEB with dummy information related to it’s loader. However, you can force Miasm to load specific modules and use them to create a consistent loaded modules linked list (see below). To load all this information automatically, you can use the class miasm2.analysis.sandbox::Sandbox_Win_x86_32 which takes a binary’s path as input, and sets up a minimal environment like the one previously described. An example is in miasm/example/jitter/sandbox_pe_x86_32.py. The PE binary given to the sandbox is iexplorer.exe (the exploit target). This binary will serve as a host and will be used by Miasm to build the loader structure. Module dependencies will be loaded as well (they have to be present in the ./win_dll directory). # Write the PE to "sc_pe.py"
-b (--dumpblocs) to display a block trace. We have an information from the jitter that the code called the function LoadLibraryA from the module kernel32. This is the resolved function. But how does Miasm know this? In fact each time you load a library in memory, Miasm adds a breakpoint on each of its exported addresses, and remembers the relation between the address and the exported name. When the emulated program counter reaches one of these breakpoints, the emulation is paused. Miasm then tries to find a Python function whose name has the form ModuleName_ModuleFunction and calls it. The jitter will then resume the execution to the fresh program counter, and the execution resumes as if the Windows function had been called. This mechanism allows us to script or simulate any function in Python! By the way, if you implement the previous two helpers for ARM, you can use the same Python code to simulate LoadLibraryA on Windows for this architecture. What’s next? Another crash, obviously! That’s a bit clearer. So what’s the problem now? Miasm reaches an internal breakpoint on the function ole32_CoInitializeEx. Unluckily, this function is not implemented in the default library. But are we really stuck here? Not really. If you read the Msdn documentation, this function is used to initialize a COM object and returns 0x1 if everything is ok. Fine, let’s implement a minimalistic function in our script. Don’t you have the feeling of re implementing the Windows API using architecture independent code here? Note: we deliberately changed the output of the script to avoid being flagged as a bad host. The shellcode tries to execute the freshly downloaded binary. First of all, congratulations to the readers who reached this point: that was a big post. We have done a dynamic analysis of a shellcode à la try’n die style. You have a good idea of Miasm’s internals as well. I admit the ‘cost’ for a Miasm’s newcomer is a bit expensive, and I realized it again while writing those lines, but you may end up with a flexible tool to do such analysis. As a remark, try to modify the kernel32_myCreateProcess to make it fail. The shellcode behavior is modified. This type of approach is clearly not the solution to all problems, but it can help on specific analysis. Note the script can also be used on shellcodes belonging to the same campaign. As a bonus, you have a second shellcode in the linked archive: Give it a try! © Copyright 2015-2016, Serpilliere. Powered by Tinkerer and Sphinx.